Nowadays many free websites have registration walls, user can't acesss data without registration. User have to registered themselve first on a free Web site just to read some news or view some information. This registration task is very annoying, it is also a potential source of email. Now you can get access to protected content without signing up for an account. For this you have to visit Bugmenot. 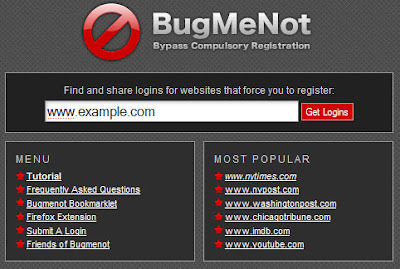 Bugmenot.com is an internet service that provides usernmes and passwords to let Internet users bypass mandatory free registration on websites. you just need to type URL of websites website that you’d like to access in the URL box on front page of bugmenot. Click on get Login. BugMeNot then will return a list of user names and passwords along with their accuracy percentage. you can easily get access to that website by using these logins and passwords.